Essay writing is an essential element of the academic study. It needs not only decent writing skills and analytical thinking but also the capability to make deep research. Depending on the essay type, this paper form has diverse purposes, yet the structure remains the same. Nevertheless, this type of essays is generally assigned to university students. 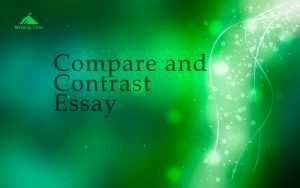 A compare and contrast essay evaluates the resemblance and dissimilarities between two certain aspects (occasions, books, people, products, etc.). Besides indicating in what aspects those two subjects are alike or various, this work also discloses a deep and consequential argument about them. It requests to state something new and unknown, show and prove that one issue is better than the other, lead to new understanding and use supported facts in arguing a point. And if at first sight, you may think the work is too complicated for you to complete, after looking at this concise but educative article about the compare and contrast essay structure, you’ll to write a wonderful compare and contrast essay! When selecting the block structure for your essay, you’ll be obliged to point all the info about one subject and then write about the second subject. The greatest advantage of this essay type is the easiness of the writing process. Your work is much more straightforward when picking right this structure type. Make sure that each part of the body includes at least two details to consider. The Introduction part of the paper is to be composed of three points: introducing the major topic, specifying the subjects, and giving the thesis statement. The latter is to give the major ideas within the work. What refers the conclusion, it shouldn’t be a copy or a rewrite of the introduction. After summarizing the main points, you need to provide evaluation and future development ideas. In the end, state how significant your research was.